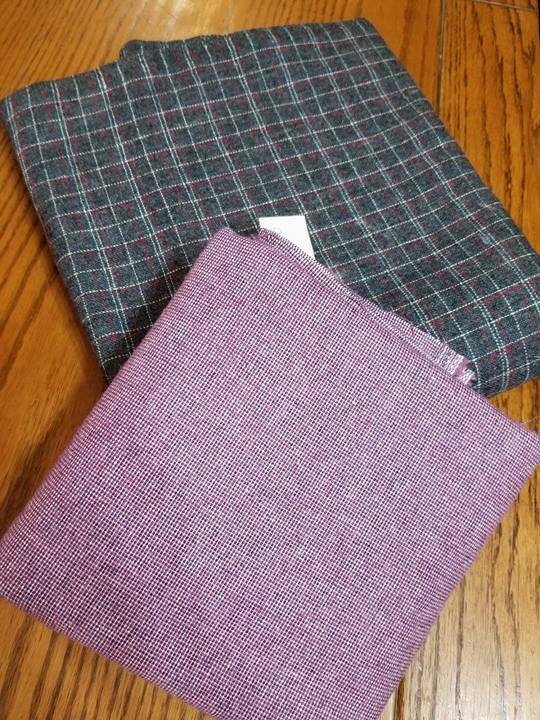 When I was thrifting I found some great wool pieces. They were $1 each. YAHOO!! If you have purchased wool before, you know that that is a steal for wool. Both are in excellent shape and there is yardage of each. Kelli was here a couple weeks ago during my big sewing room redo and sorted my wool. I have a lot. I aspire to do wool projects but lack of organization and time have prevented me….I also have about four other hobbies that I love so it’s so hard to pick and choose. I did promise Kelli no more wool….but these two are perfect and the price…PERFECT! So I bought them. I have projects in mind for them…. Remember the Buttermilk Basin projects Kelli and I want to do? These are the patterns I bought. I think the purple would be perfect for the NEST project. I thought somehow the wool might work with these. I’m so wish that I had more hours in the day…there are truly so many projects and so little time. This entry was posted in Stash Report on May 27, 2018 by Jo. I do a lot of wool. In fact I just prepped the Fall hexi Buttermilk Basin hanging . For me the secret is to prep the projects so they are ready when I have a few minutes . Buttermilk Basin has some wonderful patterns and I love the look of all those cute projects but wool is something I promised myself not to collect, lol. Your two pieces are a real find for that cost, glad you added them to the textile collection.